Contents : 38 lute pieces including one (no 29) for two lutes. Intabulations of Mass movements, motets chansons and instrumental ensemble works by: Agricola (7), Isaac (3? ), Josquin (3), Brumel (2), Busnois (2? ), Caron (2? ), Obrecht (2? ), Ockeghem (2), Congiet (1? ), Ghiselin (1), Hayne (1), Martini (1? ), Morton (1), Stockhem (1), Tadinghem (1), Weerbeke (1), mainly arrangements of vocal works previously published by Petrucci 1501-1505; 10 Ricercars by F. Spinacino. 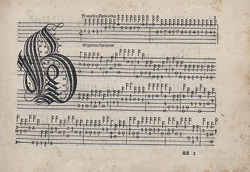 The volume contains Instructions in Latin and Italian for reading tablature.